"41AN1-35, Burial E-6" by Timothy K. Perttula and Robert Z. Selden Jr.
DECORATION: There are seven engraved panels on the rim, and the panels are defined by upper and lower horizontal engraved lines. The panels are large rectangles with hatched triangles at the four corners of the rectangle. Each rectangle is defined by four closely-spaced vertical engraved lines. There is a narrow blank rectangle created by the sets of vertical engraved lines between each of the rectangular panels. Poynor Engraved, var. 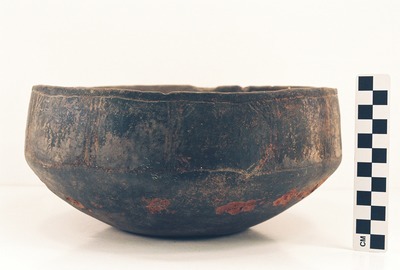 Blackburn carinated bowl (Vessel 41AN1-35).